I acquire hobbies, I guess you could say it’s my hobby. I was painting for awhile, then photography. I dabbled in candle making, one Christmas I made homemade bath oils and soaps for the families. For some reason, scrap booking has eluded me, but I did make a few photo books as gifts using shutterfly.com and was happy with the results. My latest venture is canning, it’s something no one in my immediate family does and I like the idea of feeding something to my family that I created. Last Christmas my husband bought me a canning set complete with the giant Ball blue book of canning. 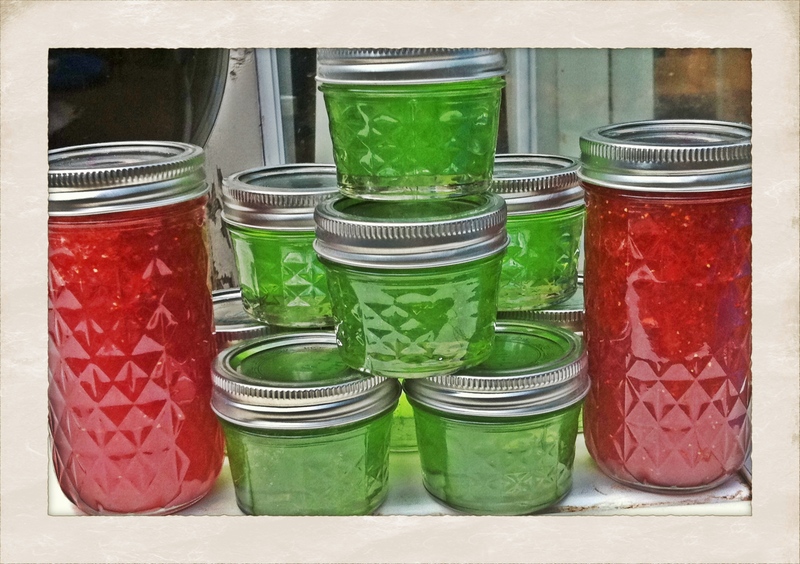 I have made several jams and a few jellies. My least successful was the grape jelly that took over two weeks to set, but was eventually edible. The best feeling was when I asked my son what kind of jelly he wanted. He asked if we had anymore of that pineapple mango so I just went to the pantry and popped one open! My husband has been following a strict diet lately and I’m being as supportive as I can, which means no undue temptation. He is also my number one taster, so I couldn’t make jams without him! His diet will be more forgiving in a couple of days and I have recipes in mind, starting with a pineapple jam. He wants to try making pineapple empanadas with the jam and I can’t wait for that! First though, finish with this last phase of his diet, survive mother-in-law’s visit this weekend, and a birthday party for my soon to be seven year old. This entry was posted in Canning, Crafts, Preserving and tagged canning, crafts, fruit, jam, jelly, recipes. Bookmark the permalink.